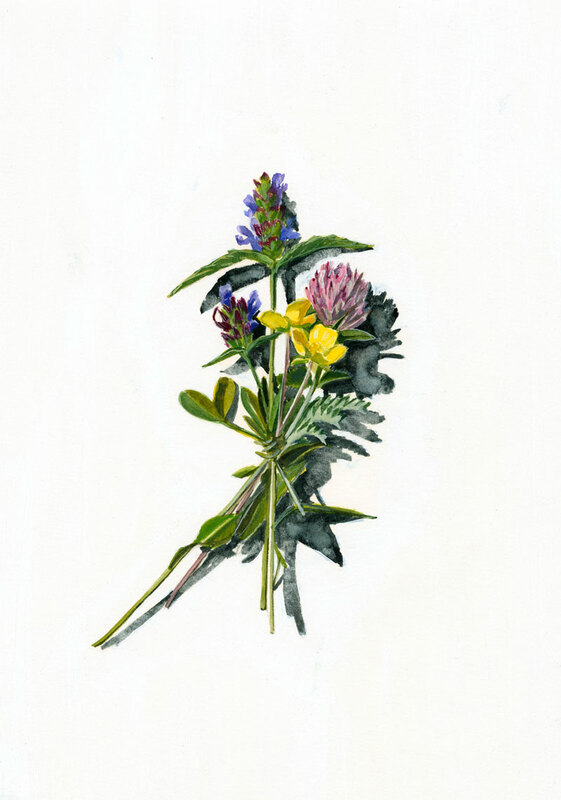 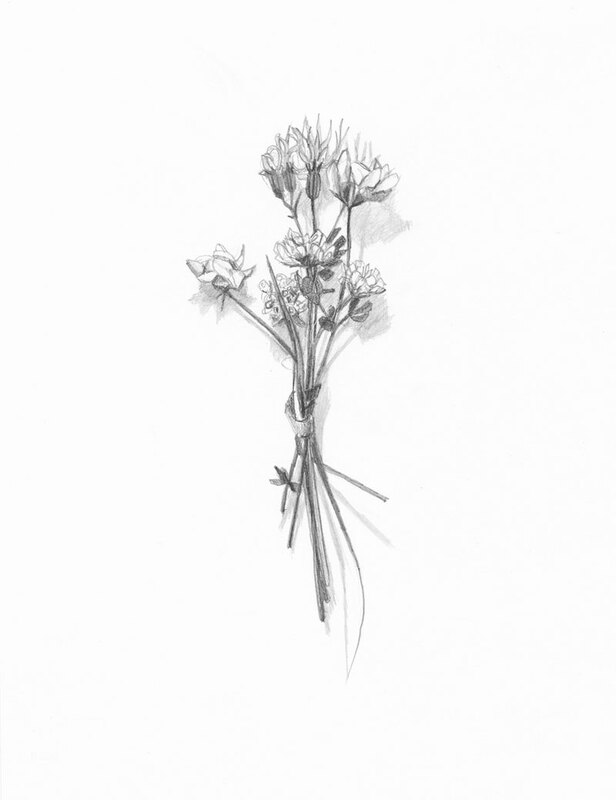 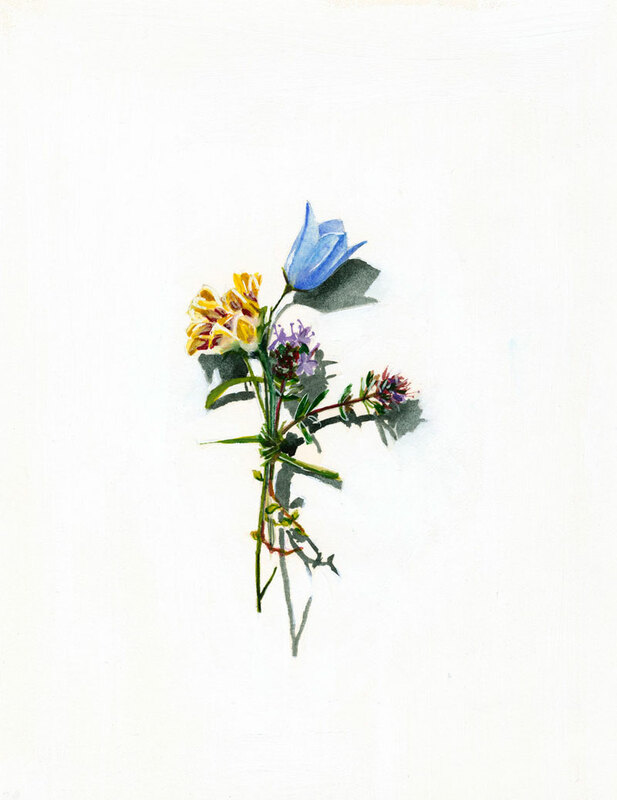 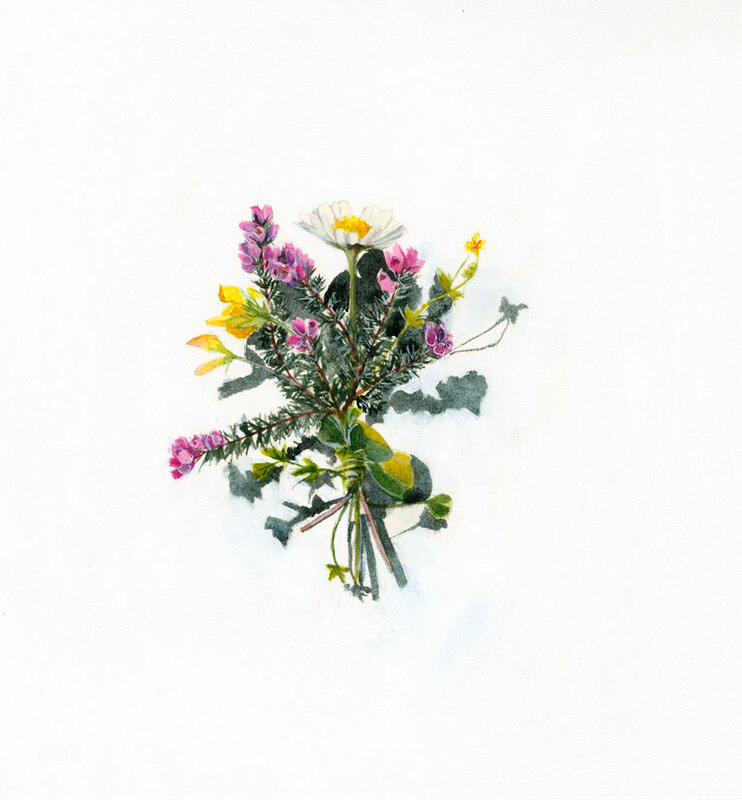 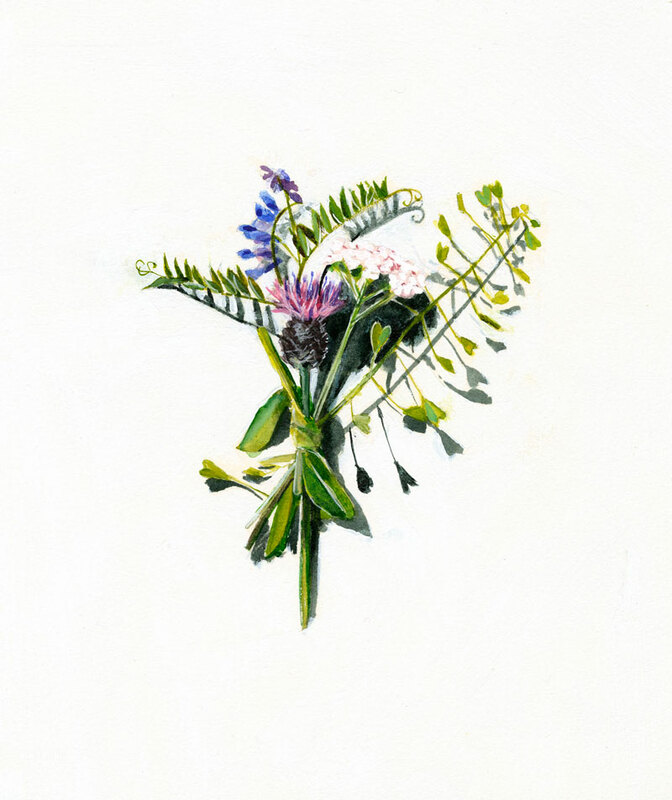 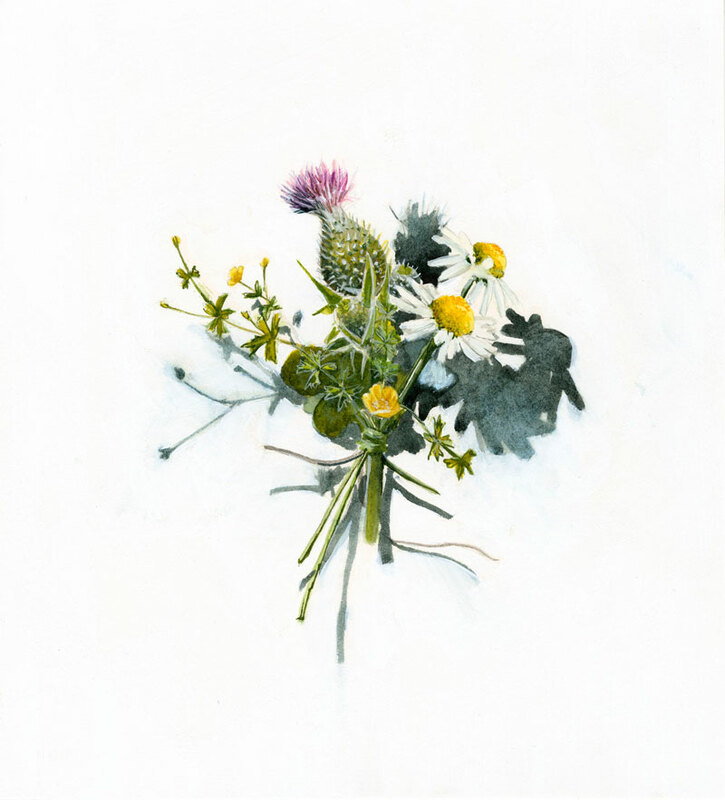 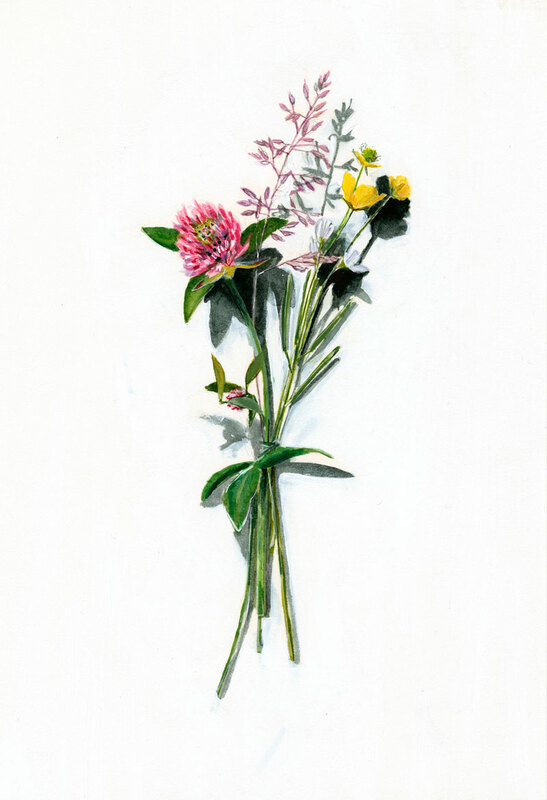 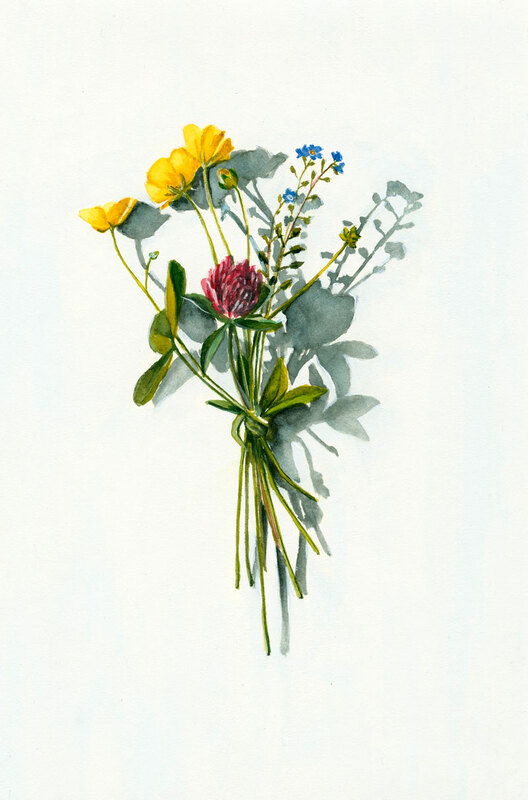 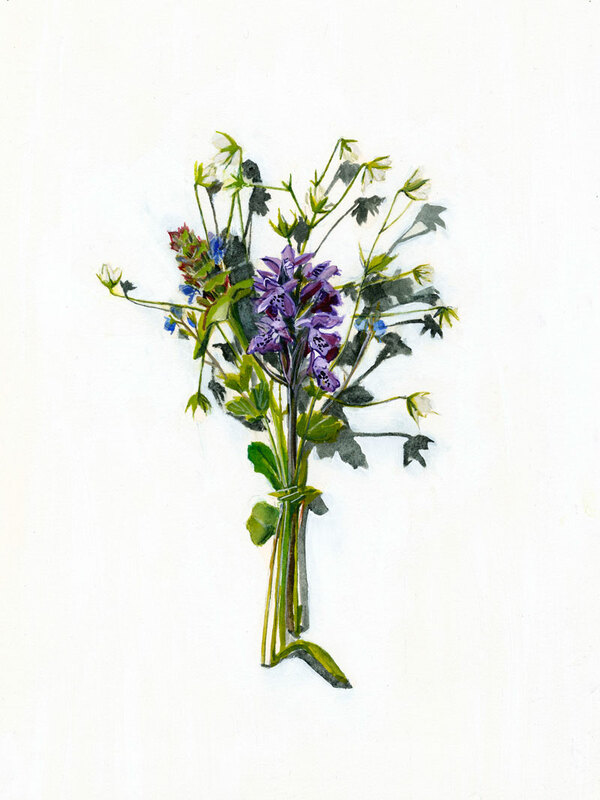 Since 2013 Kirsty has been making posies of wild flowers around Scotland, an incredible diversity of flowers, which are tied usually with clover stem or grass. 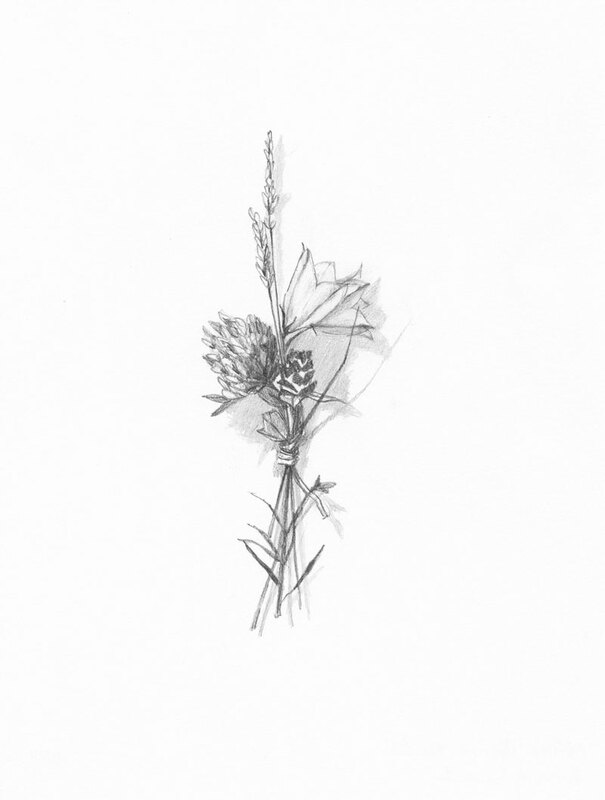 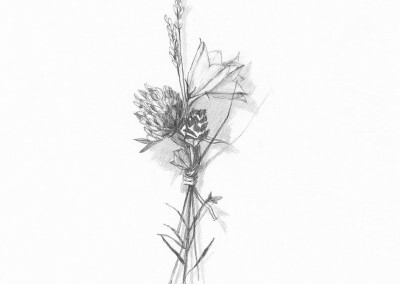 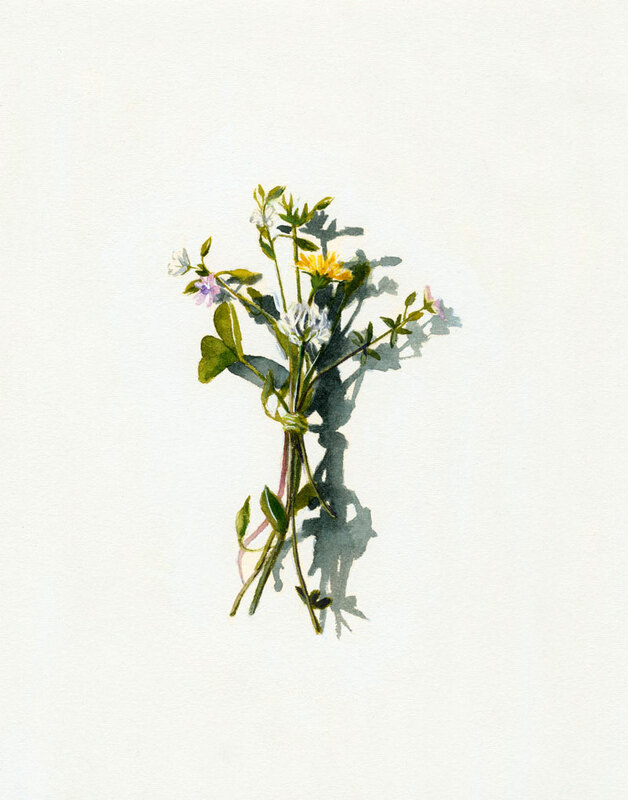 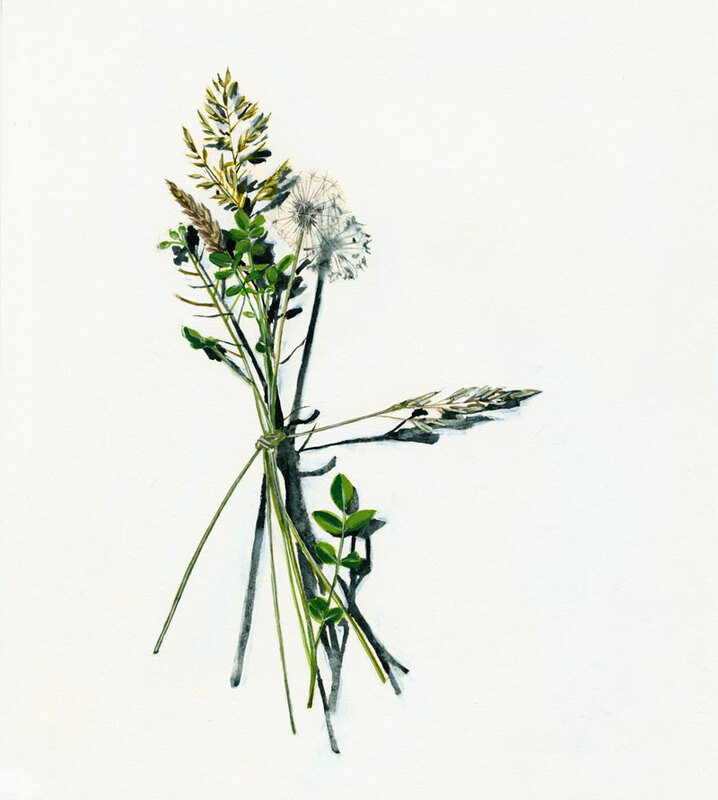 She has documented the posies photographically and then left them, on rocks, walls, corners, beneath trees etc. 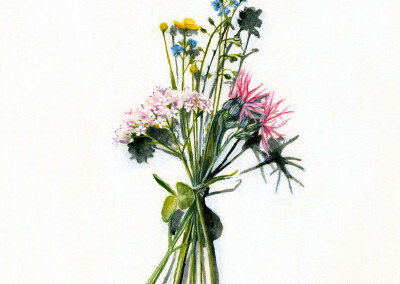 She has then painted these posies true to scale at her studio. 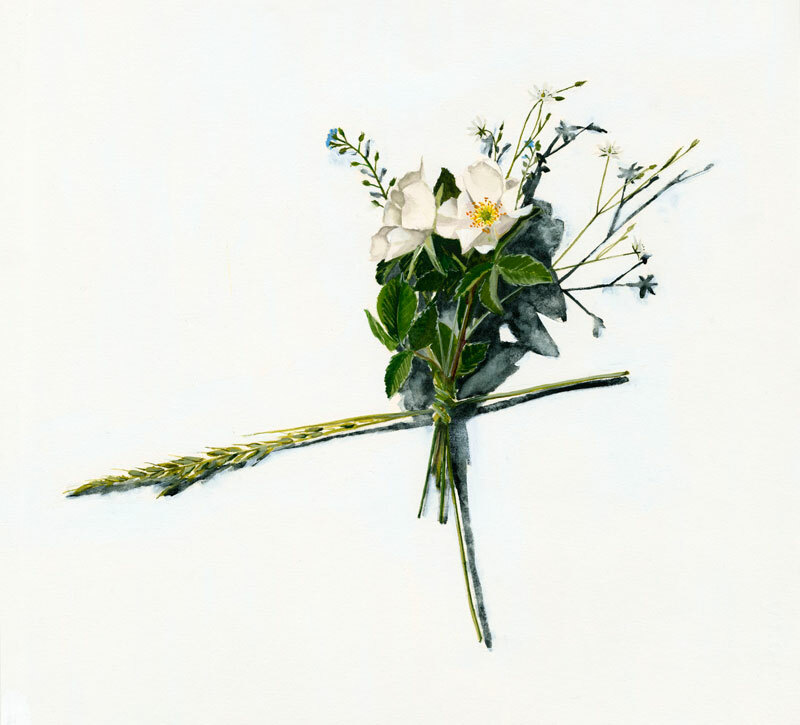 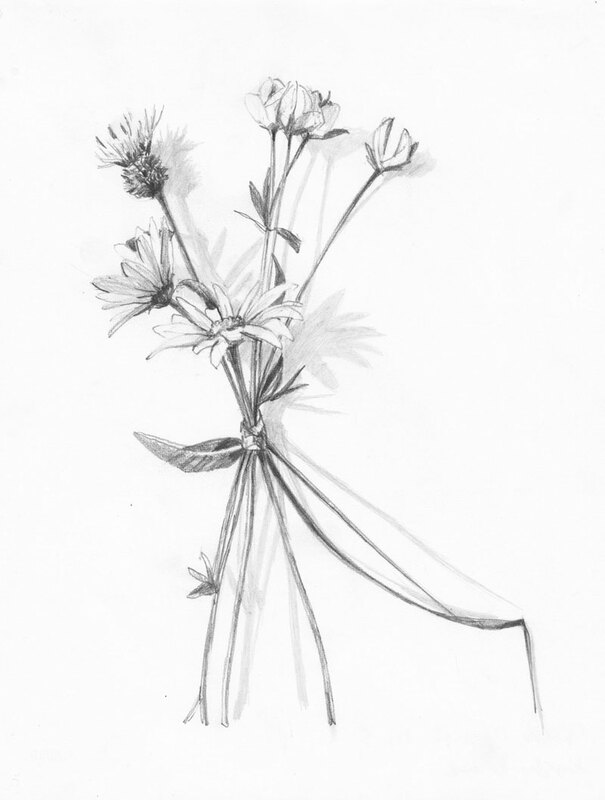 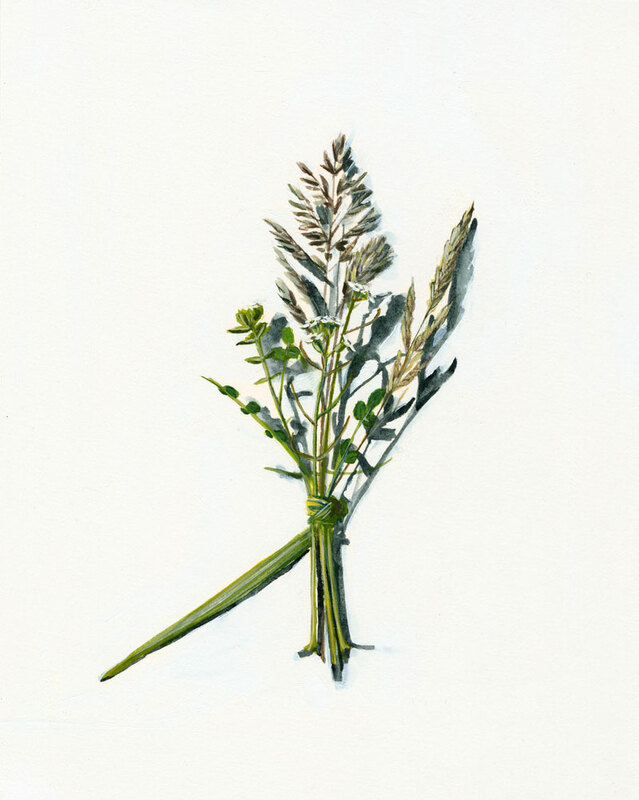 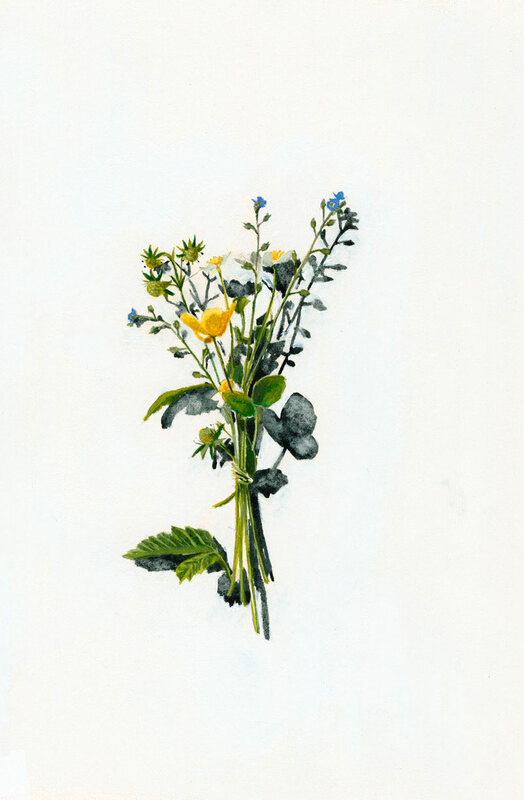 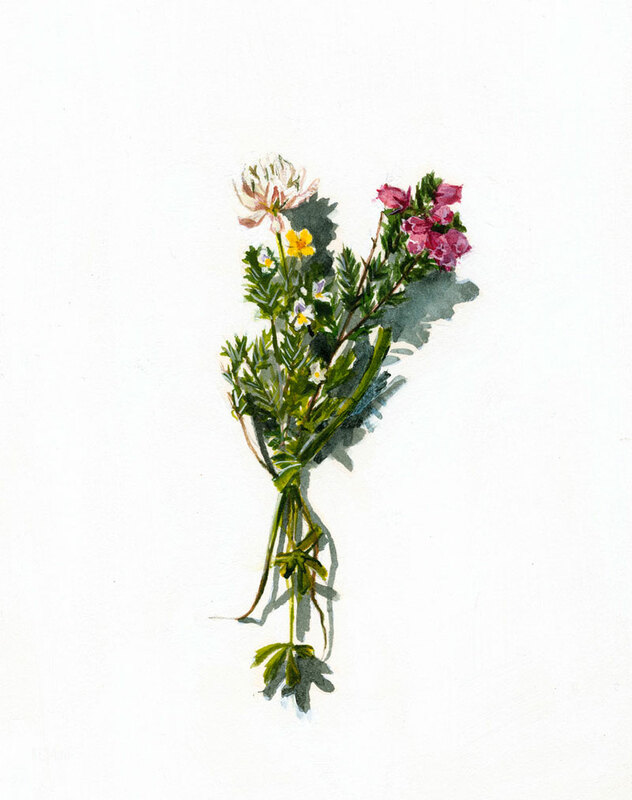 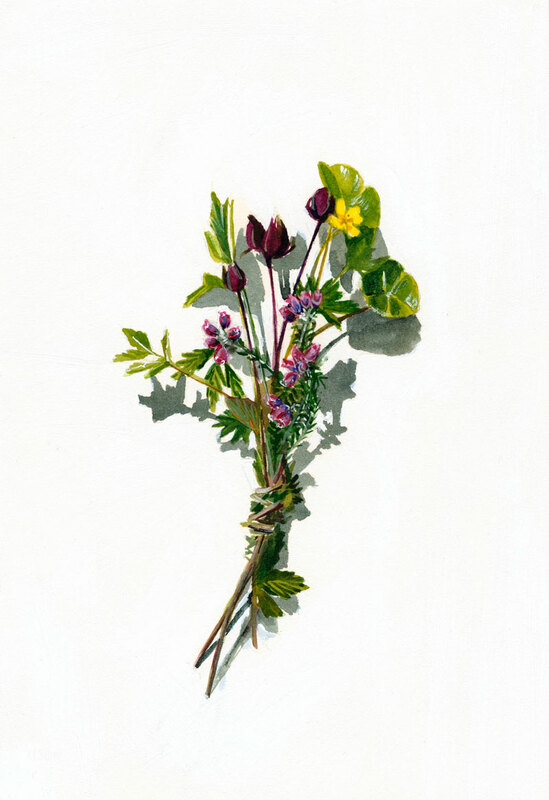 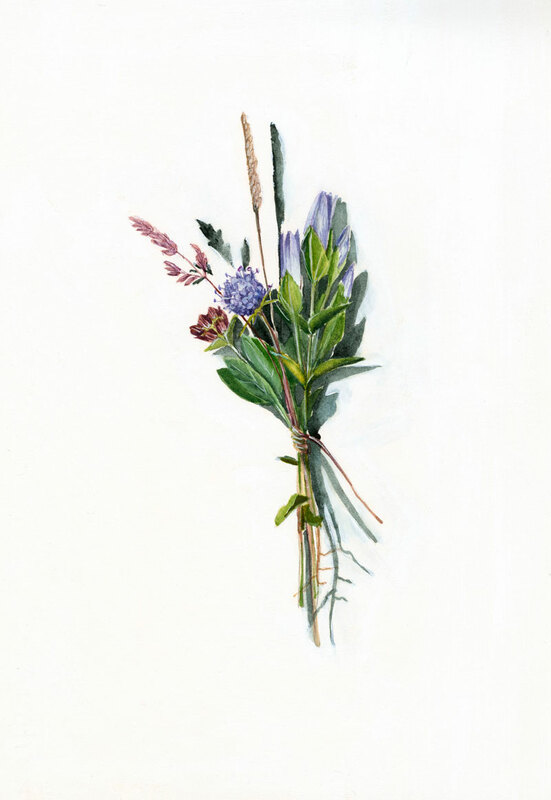 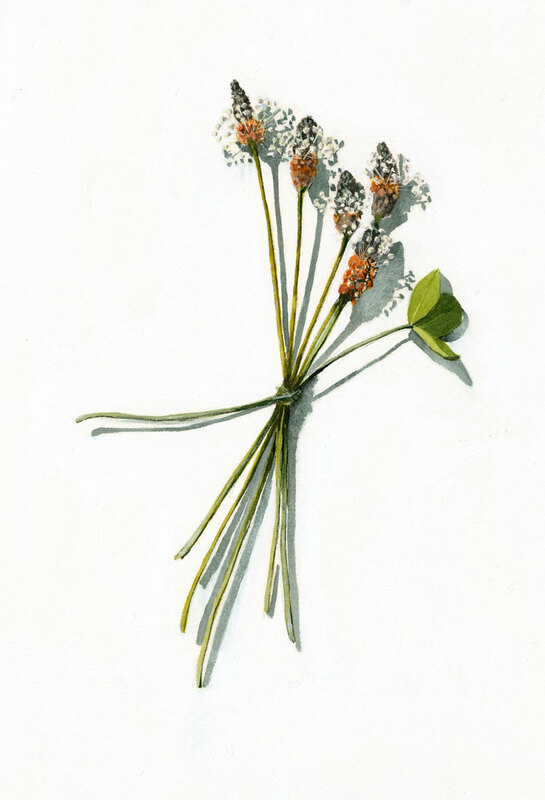 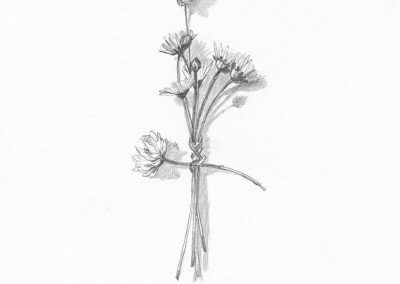 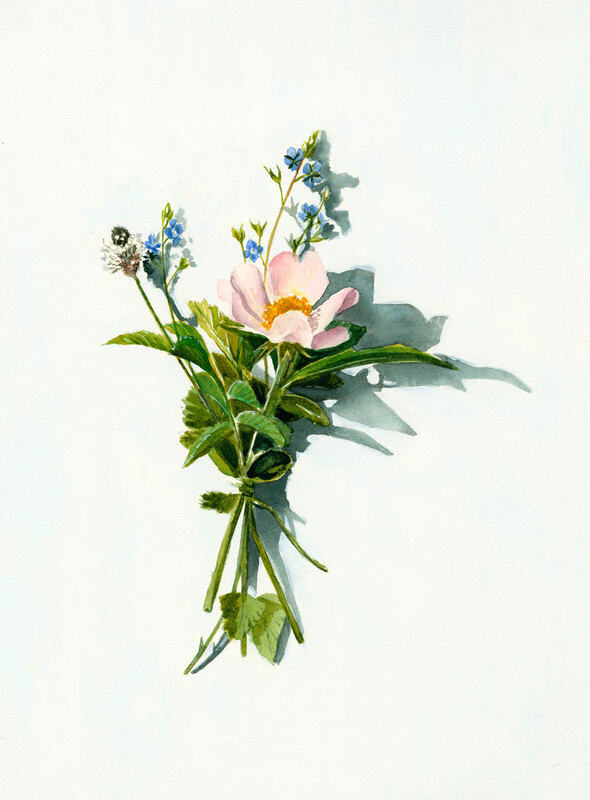 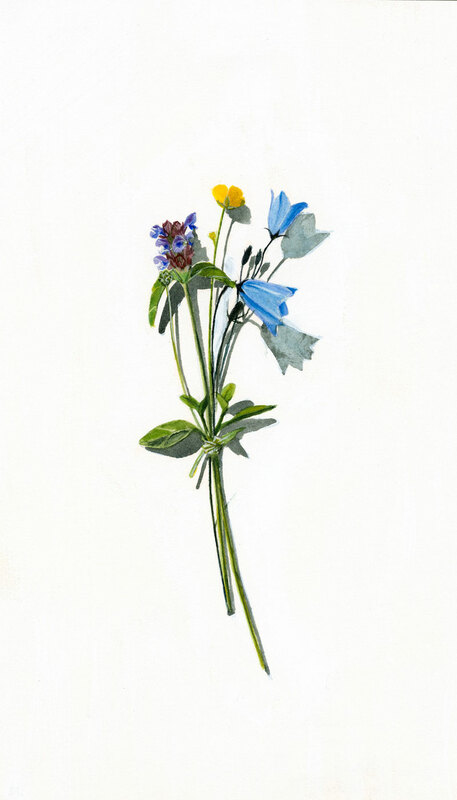 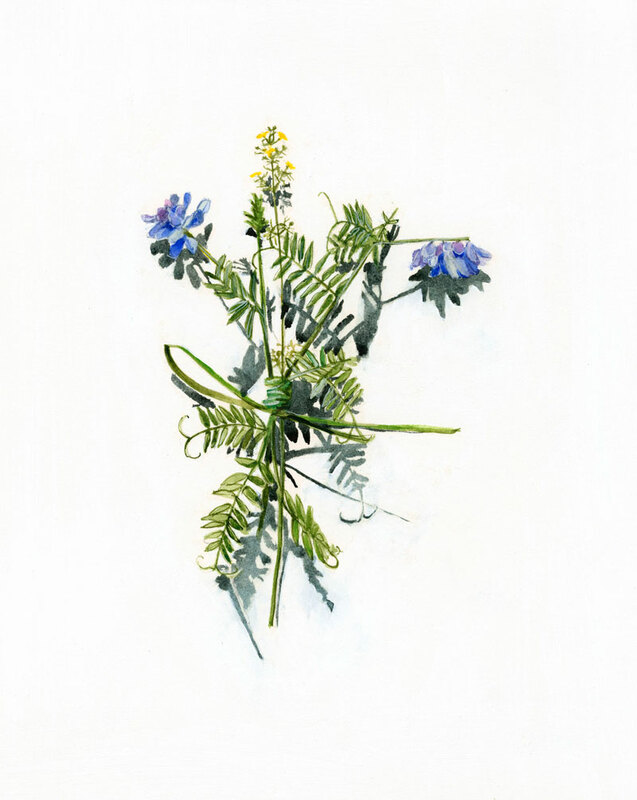 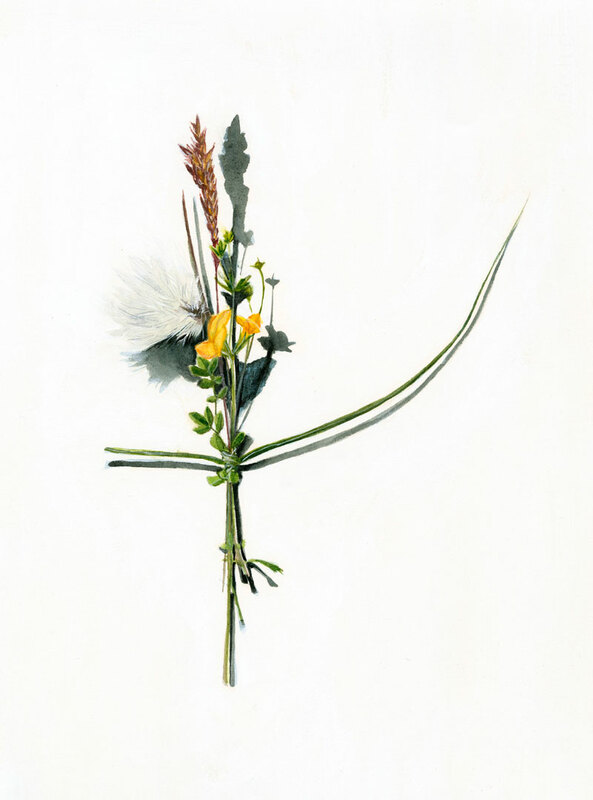 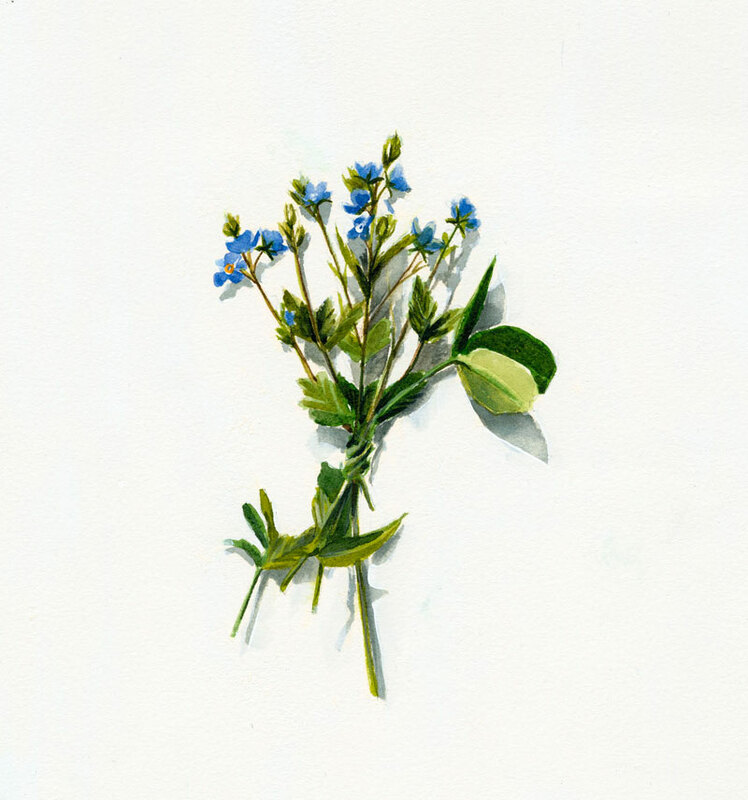 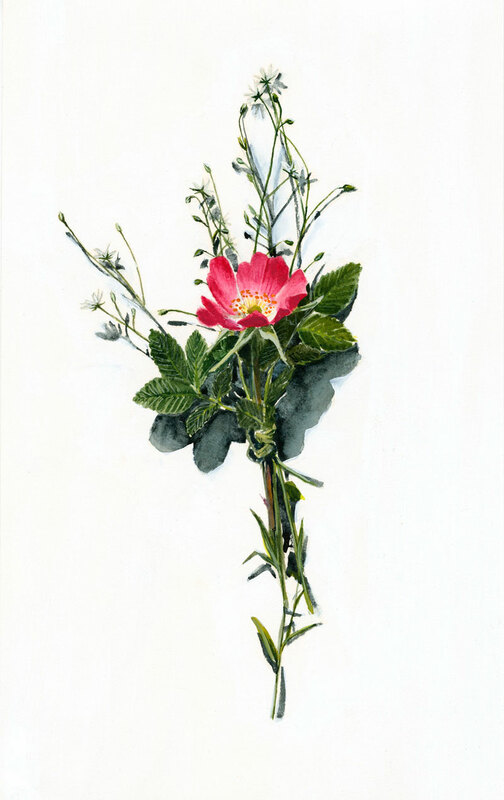 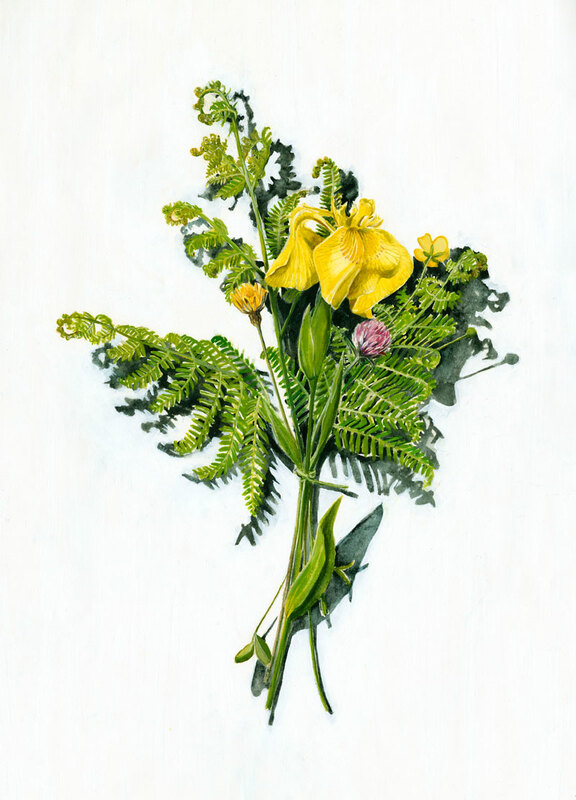 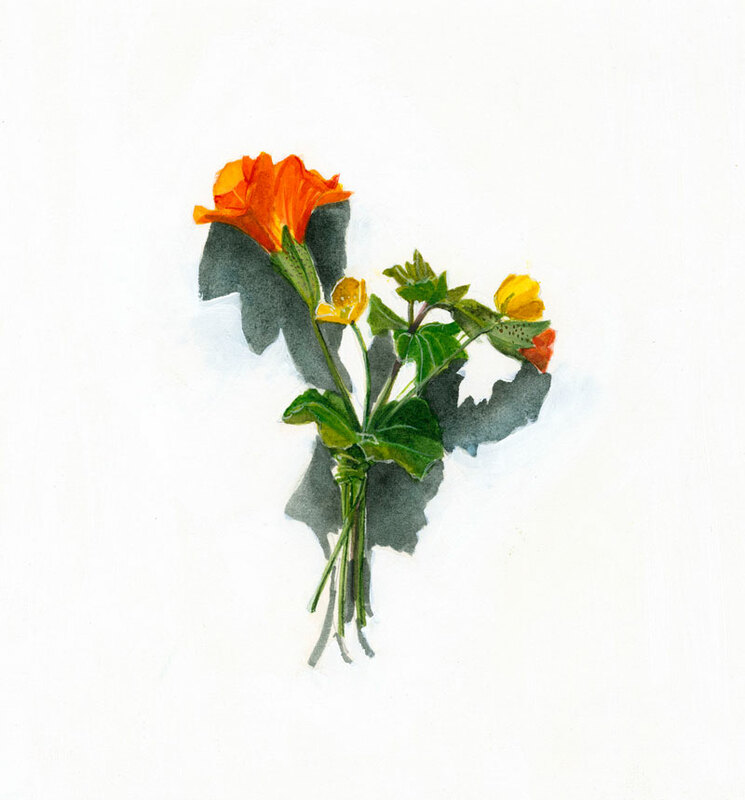 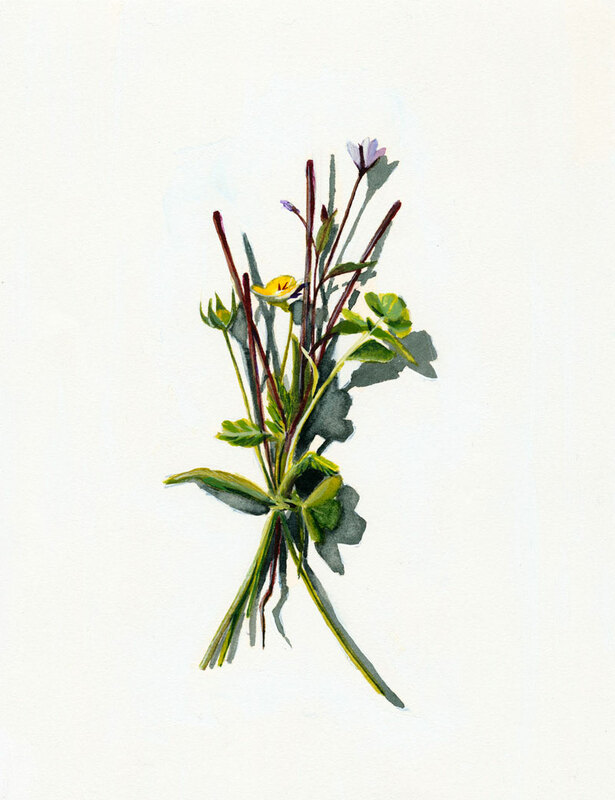 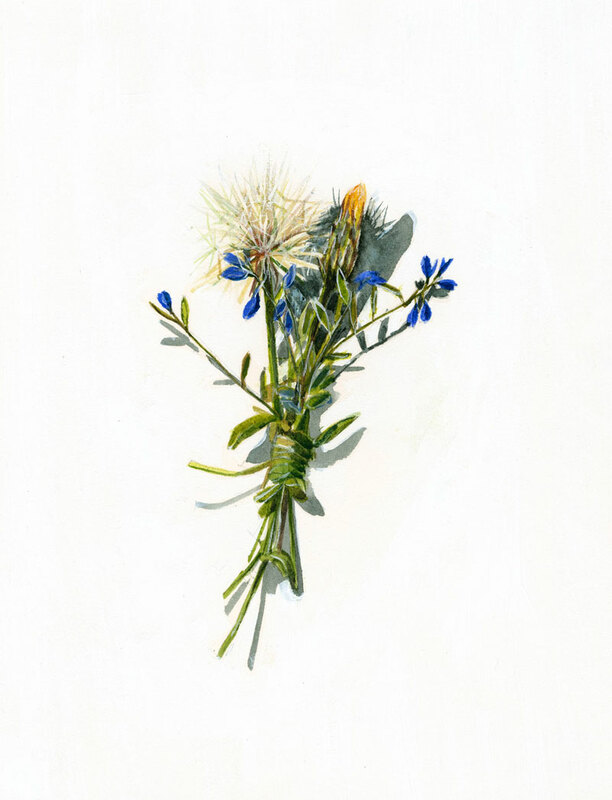 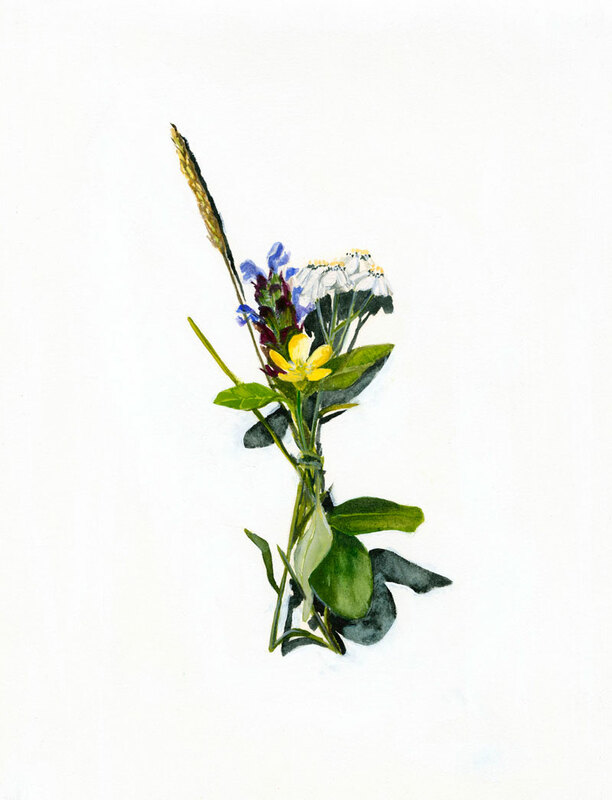 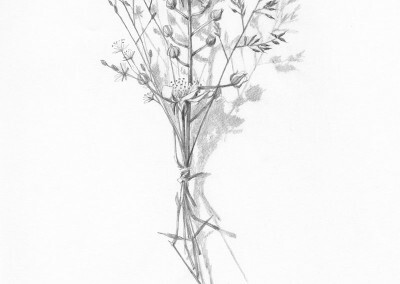 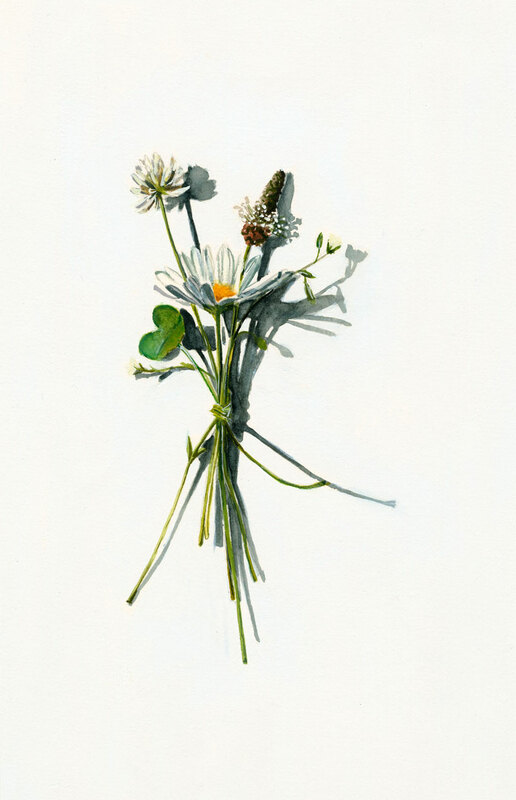 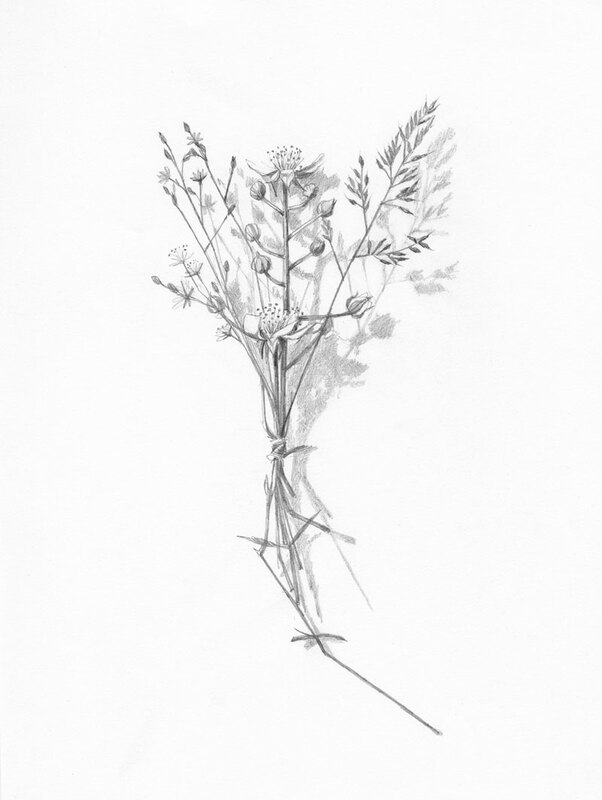 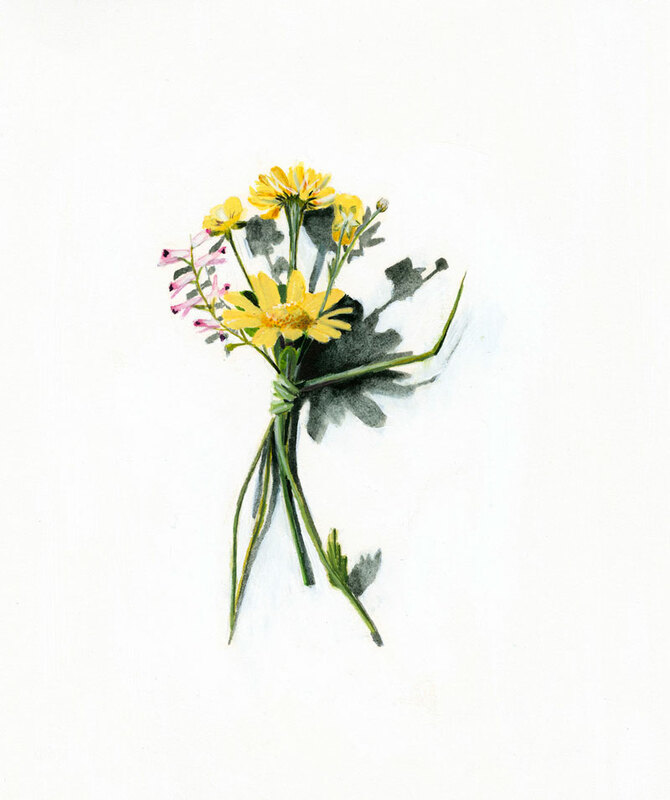 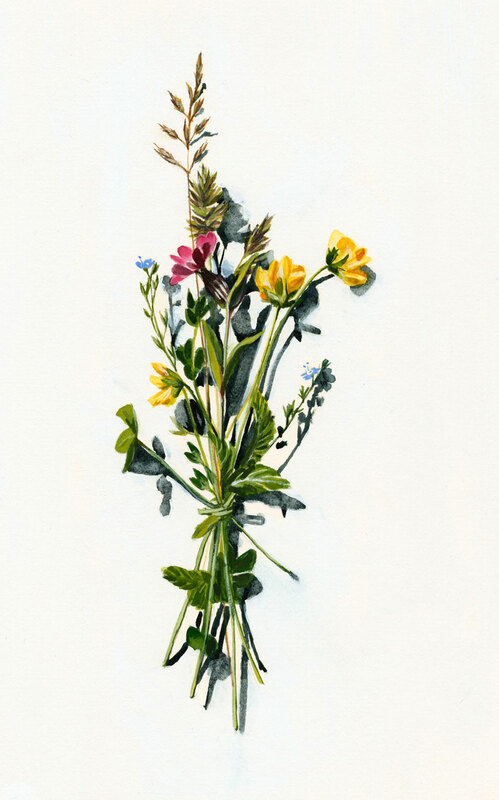 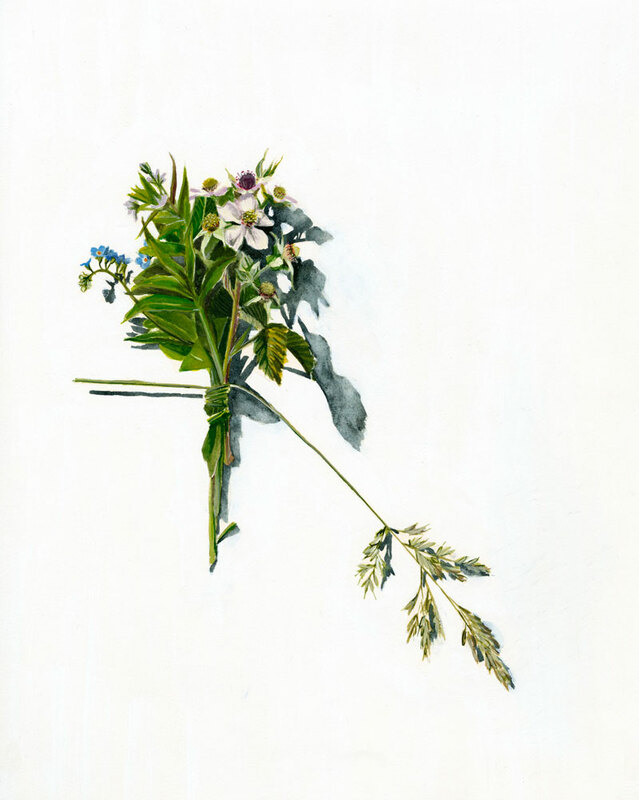 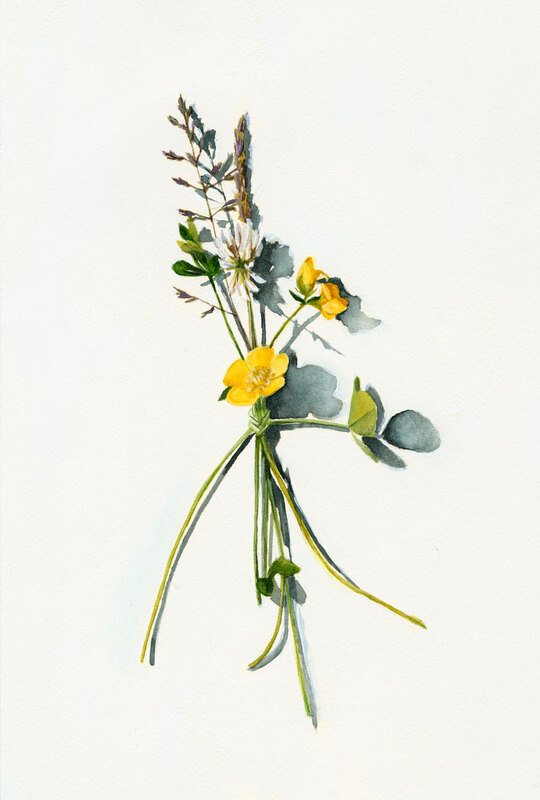 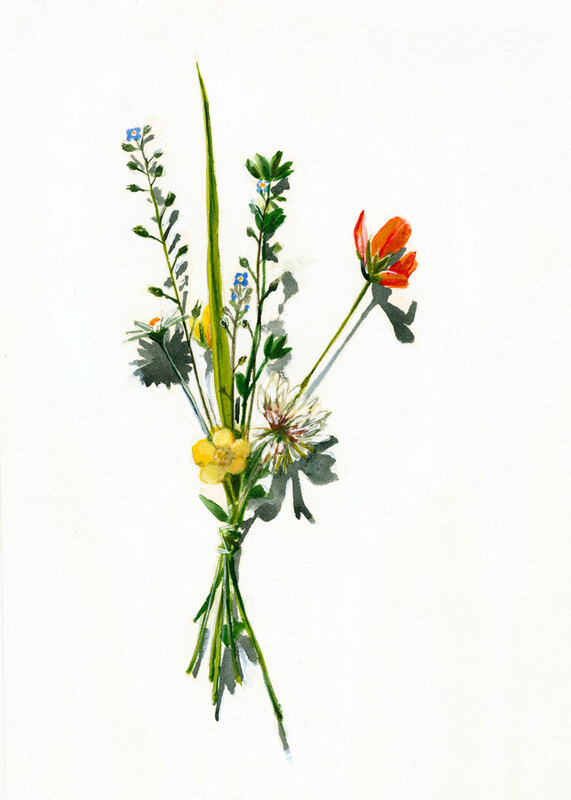 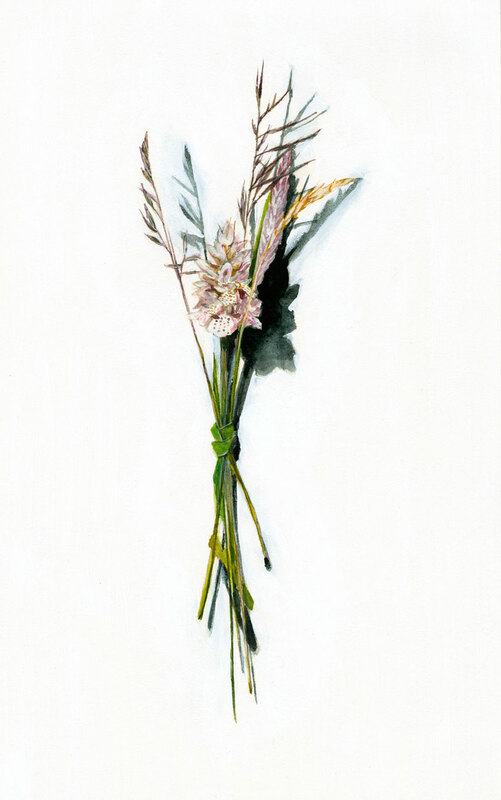 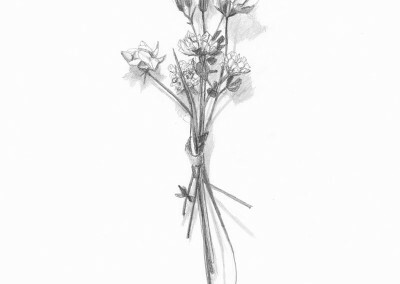 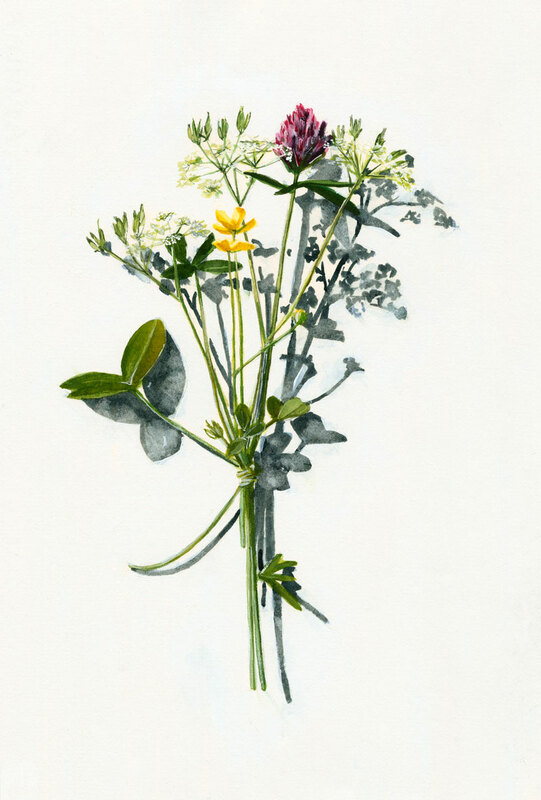 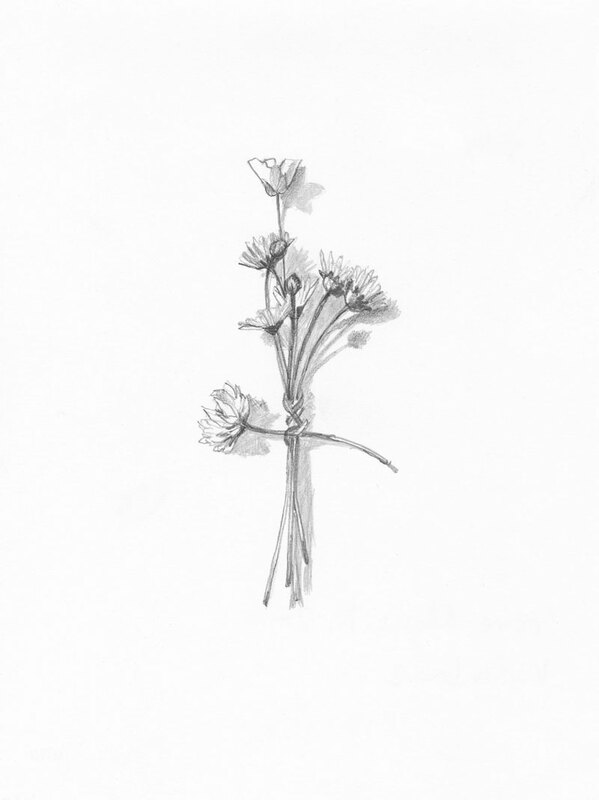 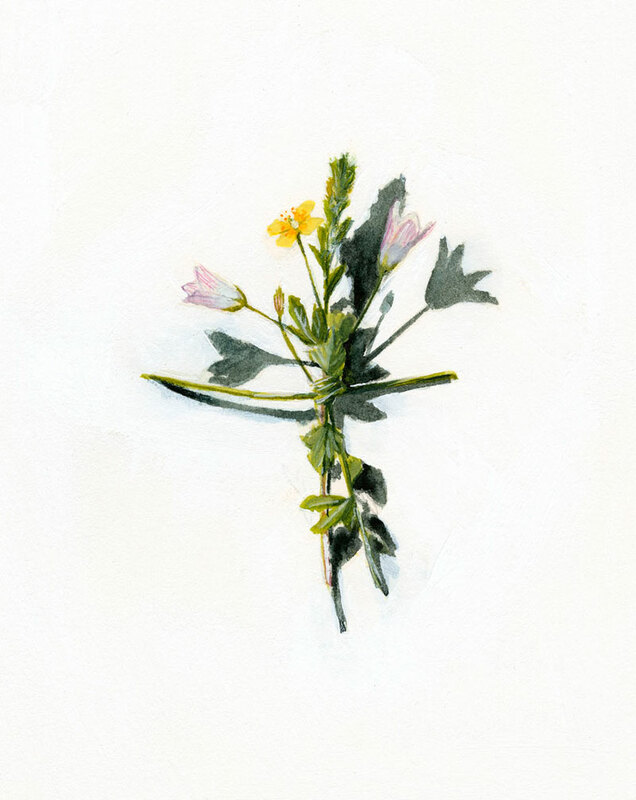 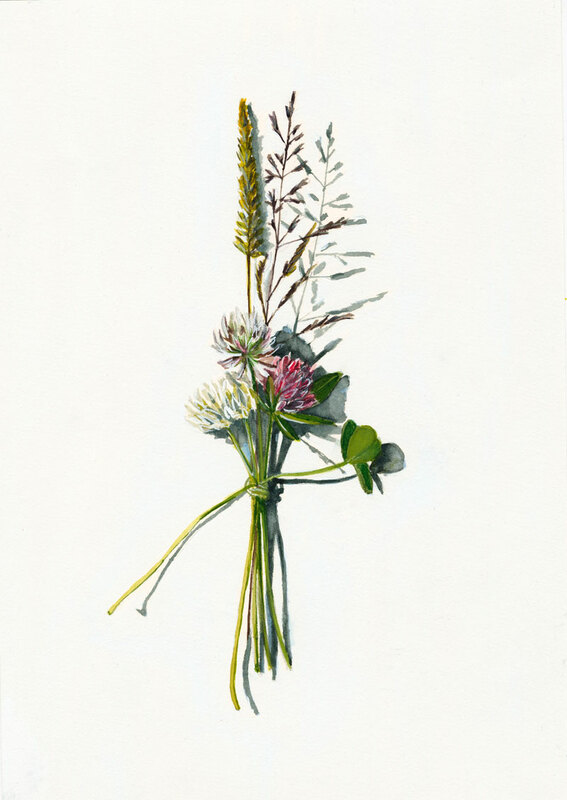 The act of making these posies and documenting them began as a way of collecting and engaging with the wild flowers and their exquisite detail, abundance, diversity and beauty but also quickly took on a sense of ritual. 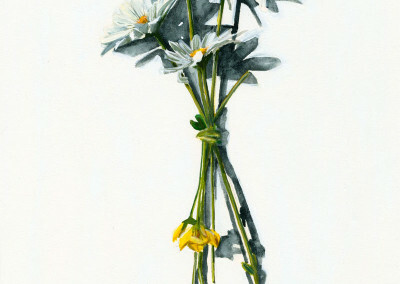 Leaving them, and painting them, took on a sense of ‘gift’. 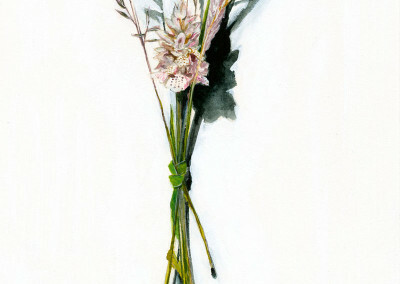 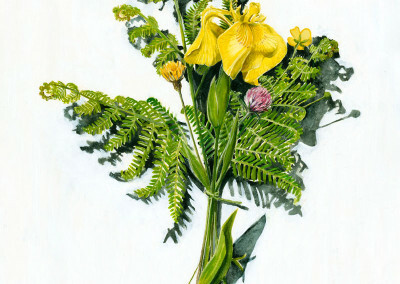 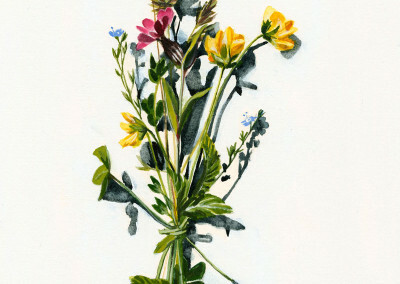 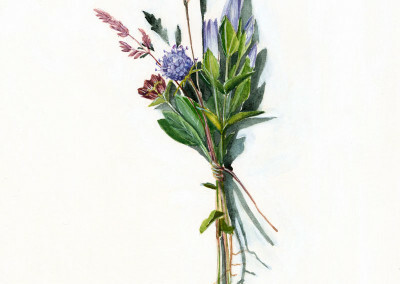 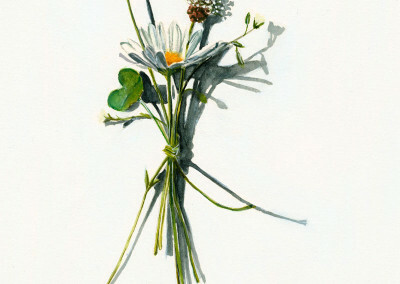 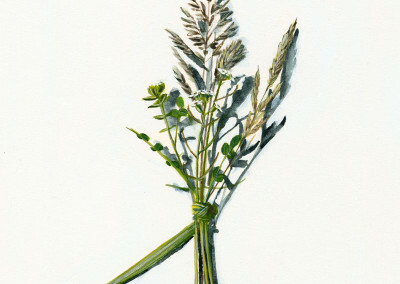 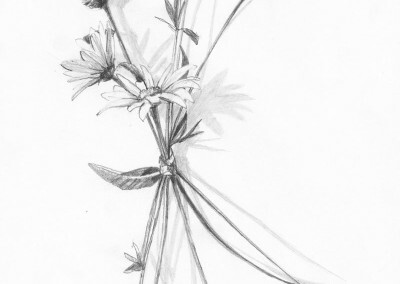 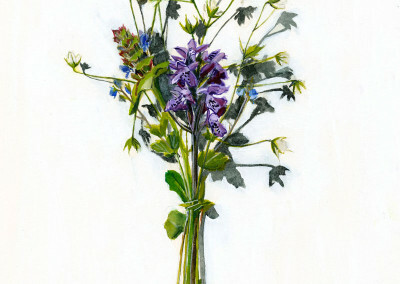 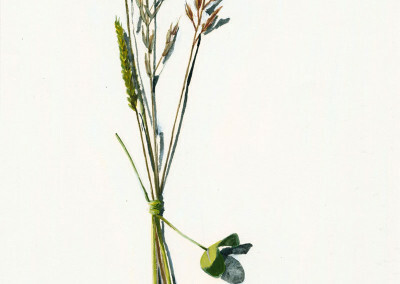 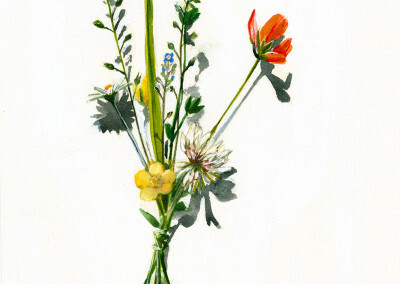 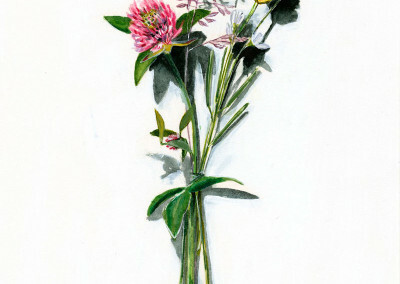 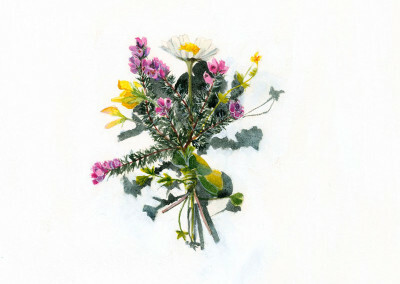 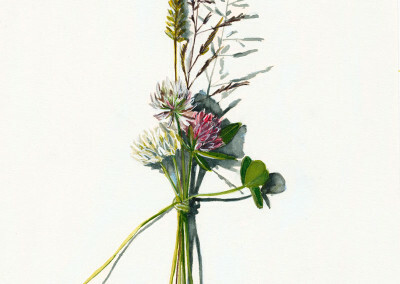 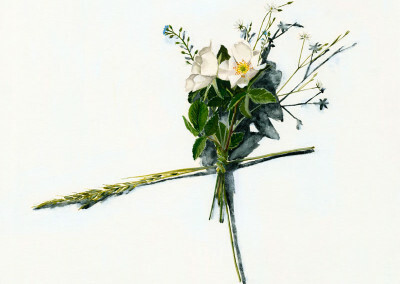 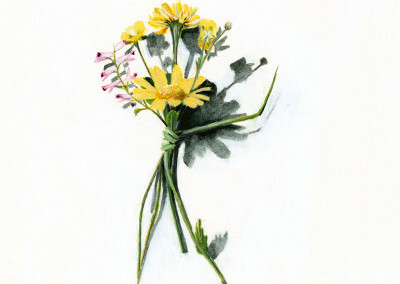 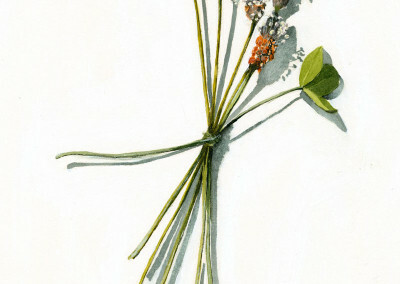 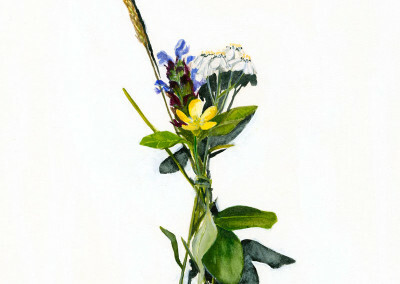 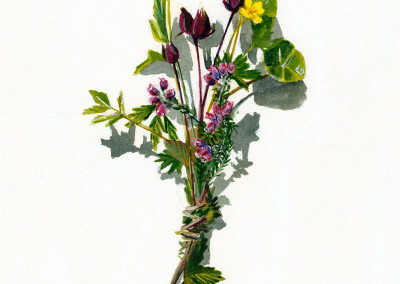 Over the centuries posies have been used as gifts to the living, to the dead, and to the gods. 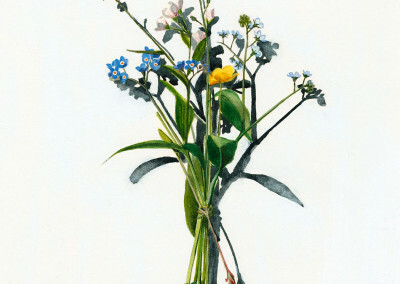 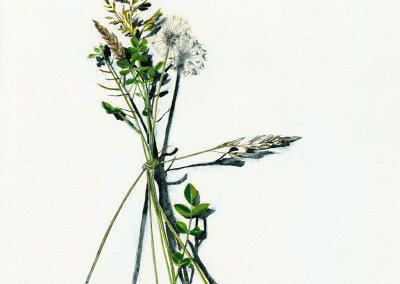 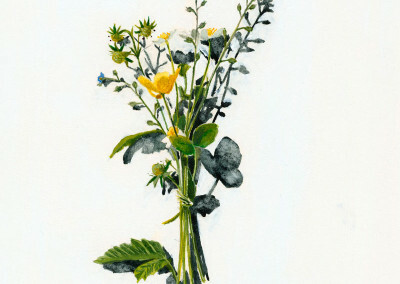 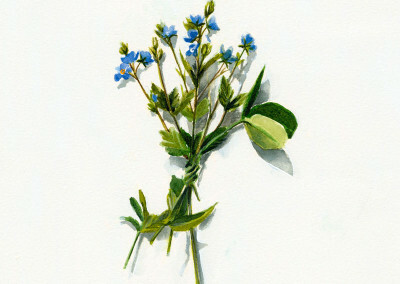 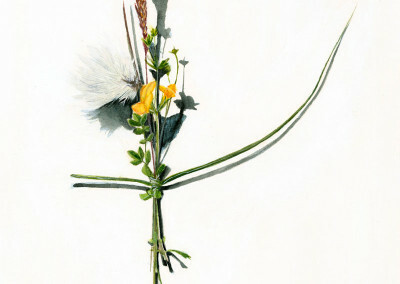 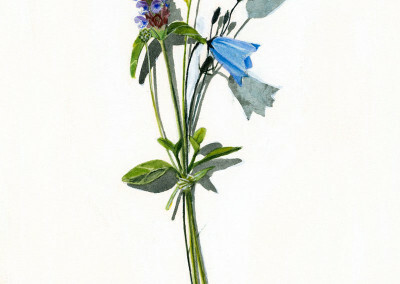 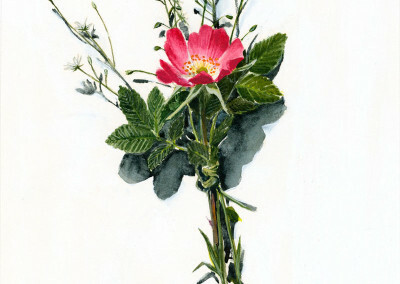 They have also been used for sending messages using the ‘Language of Flowers’. 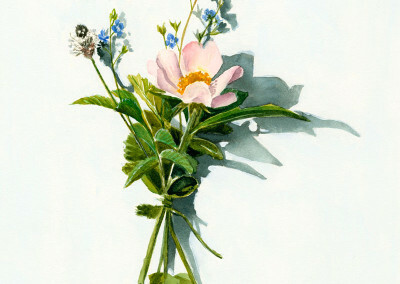 Engaging with the flowers offers a connection to ‘Nature’ in the Romantic sense, inspiring a kind of ecstasy. 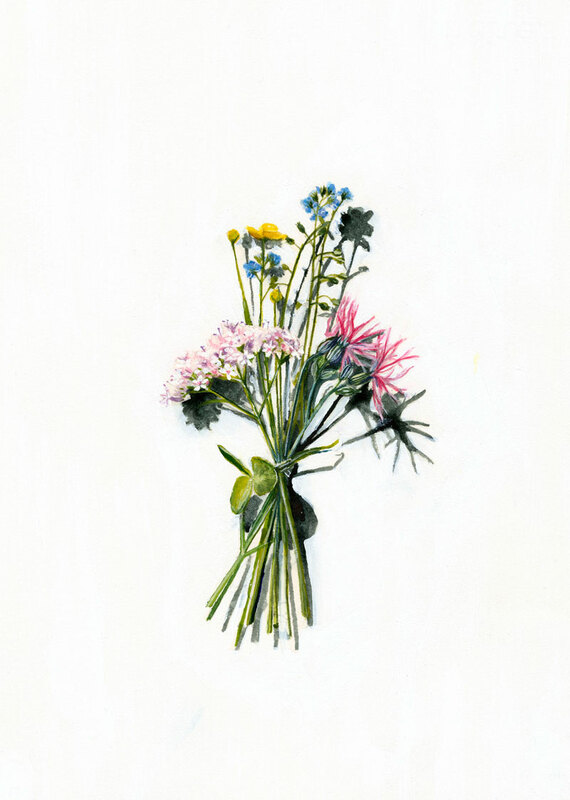 The posies also touch on the pathos and tragedy of life through their transience and fragility, and the ‘violence’ of their being picked. 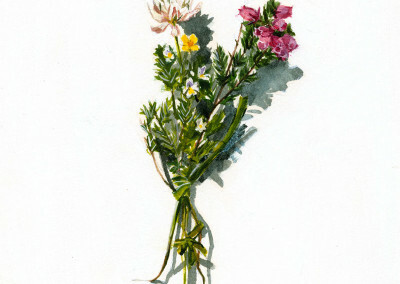 Drawing and painting them becomes a meditation upon them as well as a celebration and trying to capture their essence. 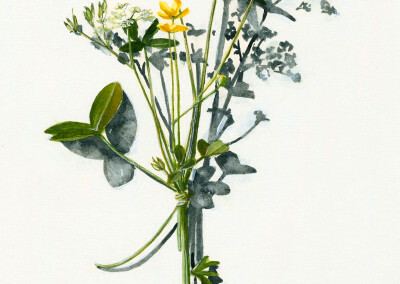 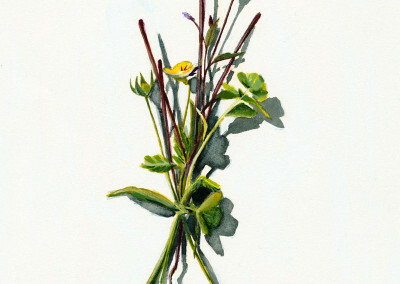 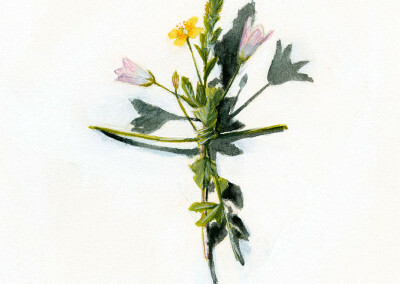 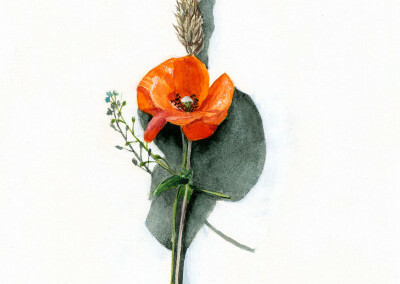 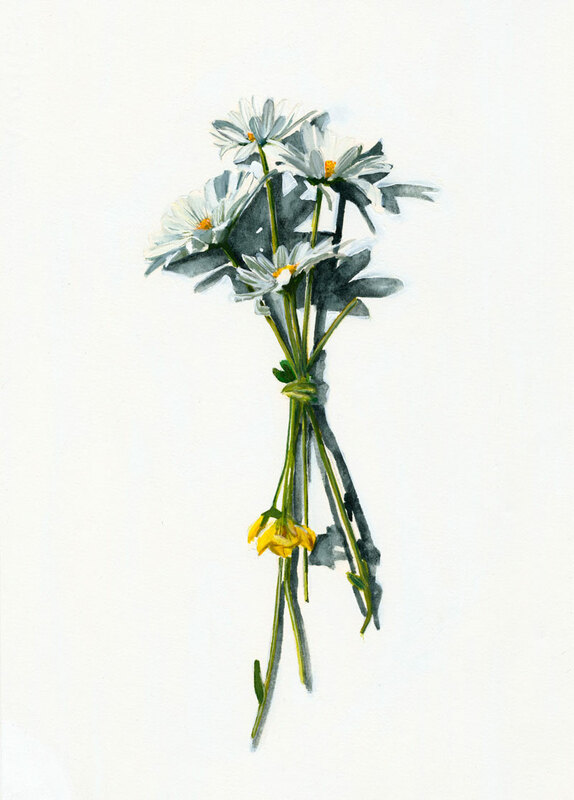 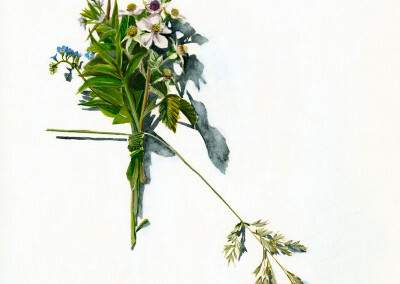 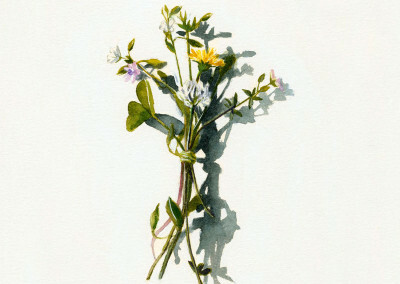 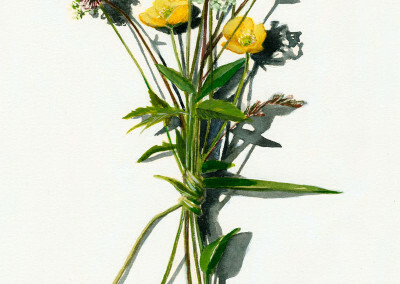 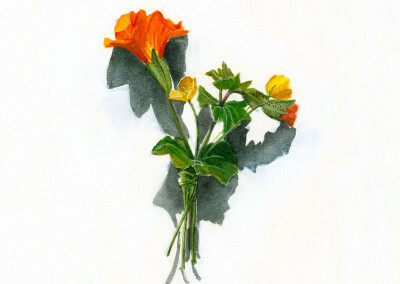 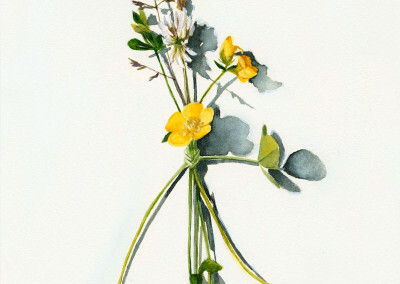 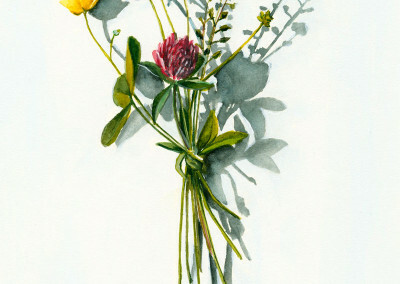 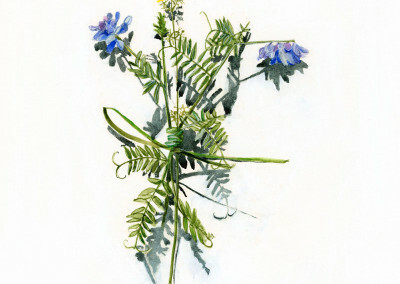 These are the first 50 paintings of posies. 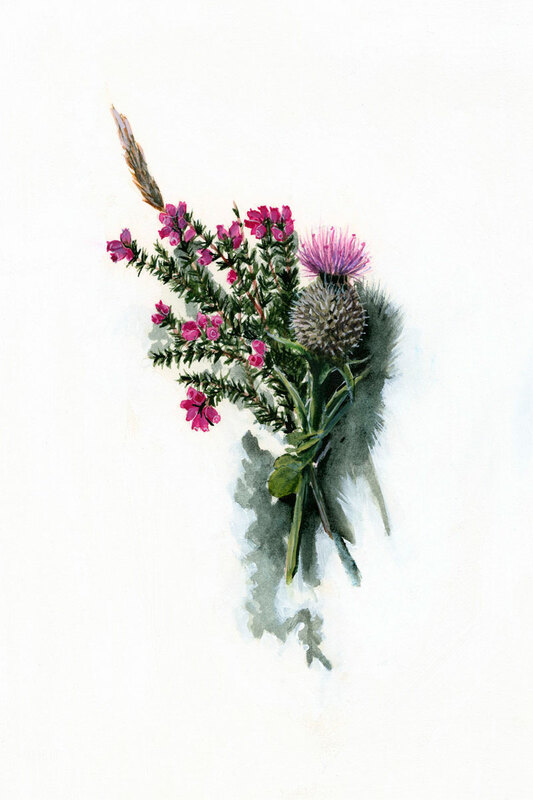 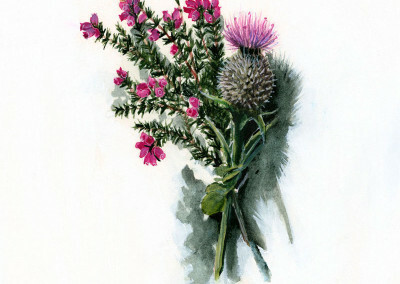 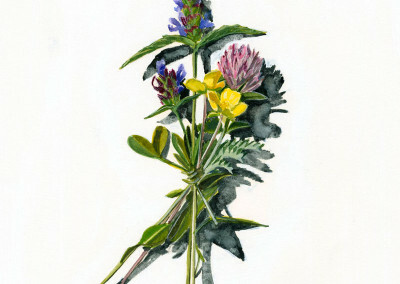 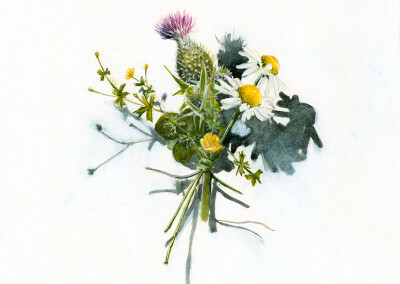 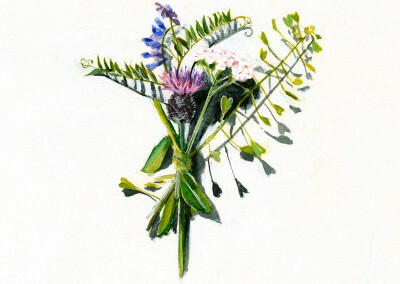 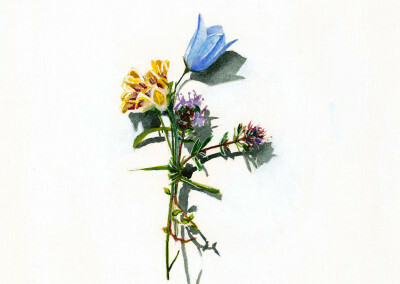 The flowers are all summer flowers found on the islands and mainland Scotland in July. 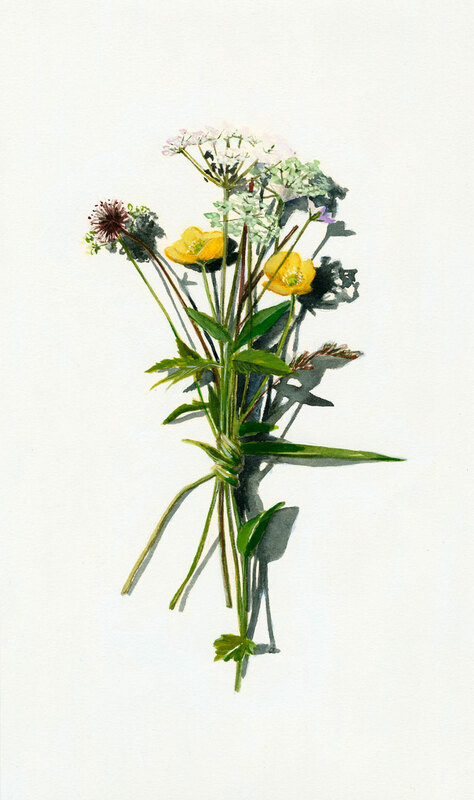 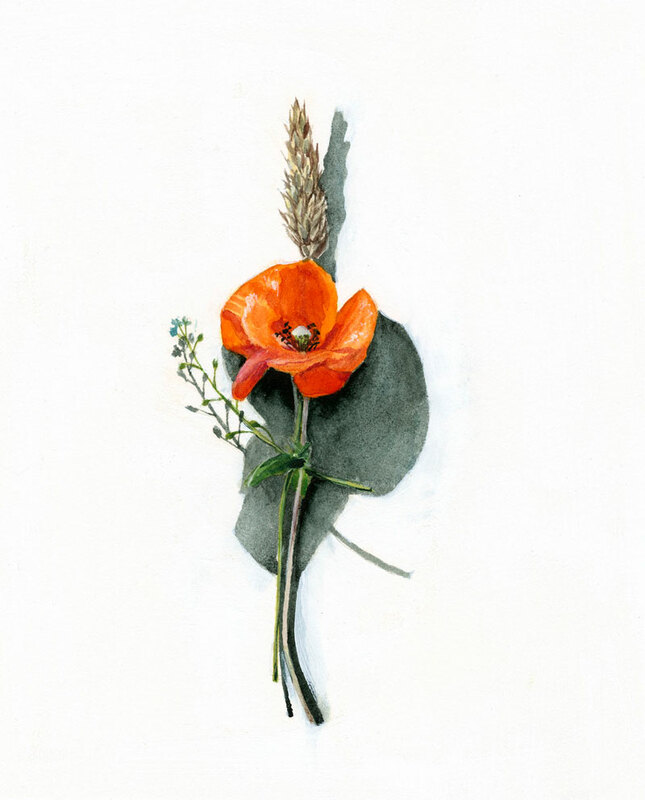 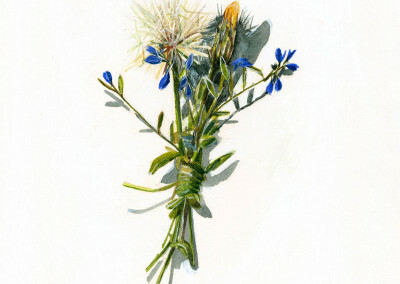 This piece was first exhibited as a large installation of posies pinned to the wall, shown at the 2015 SSA Open Exhibition at The National Galleries of Scotland, Edinburgh. 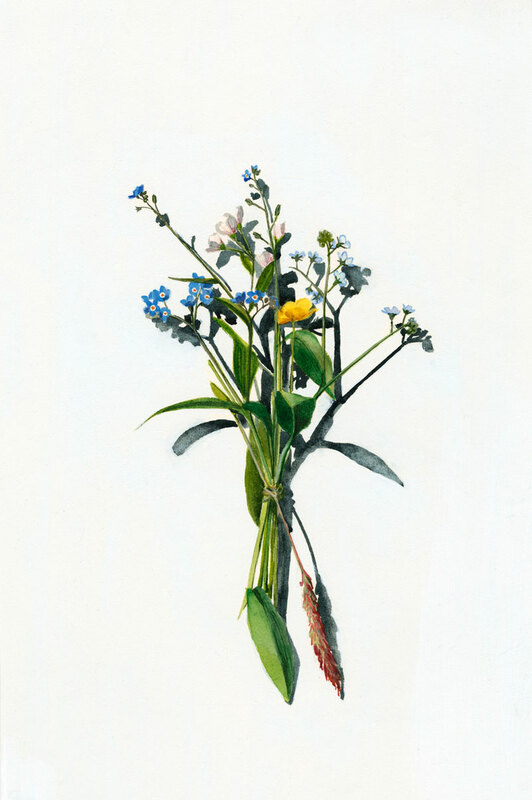 Please click on an image to enlarge and scroll through the gallery of the first 50 Votive Offerings.